Happy Friday! So happy it's almost the weekend! Many of you probably watched the Jennifer McGuire tutorial on the new Alcohol Pearl Inks where she used a straight edge and a piece of felt to make some awesome backgrounds (here is the link). If you haven't seen it I am highly recommending it!!! For my background, I used a rainbow selection of the Alcohol Pearl Inks and a piece of inexpensive felt and taped it to a straight edge. I put a few drops of the the ink directly on the felt with a bit of blending solution. and spread directly on my Yuppo paper, I repeated the process until I was happy with the result. I die cut the panel and left all of the pieces in the die. I scored my Neena 110lbs card base and simply added foam tape to most of the pieces still in the die. I used liquid glued for the smaller pieces. I flipped my panel and line it up and simply used my poker tool to place the die pieces on the base. 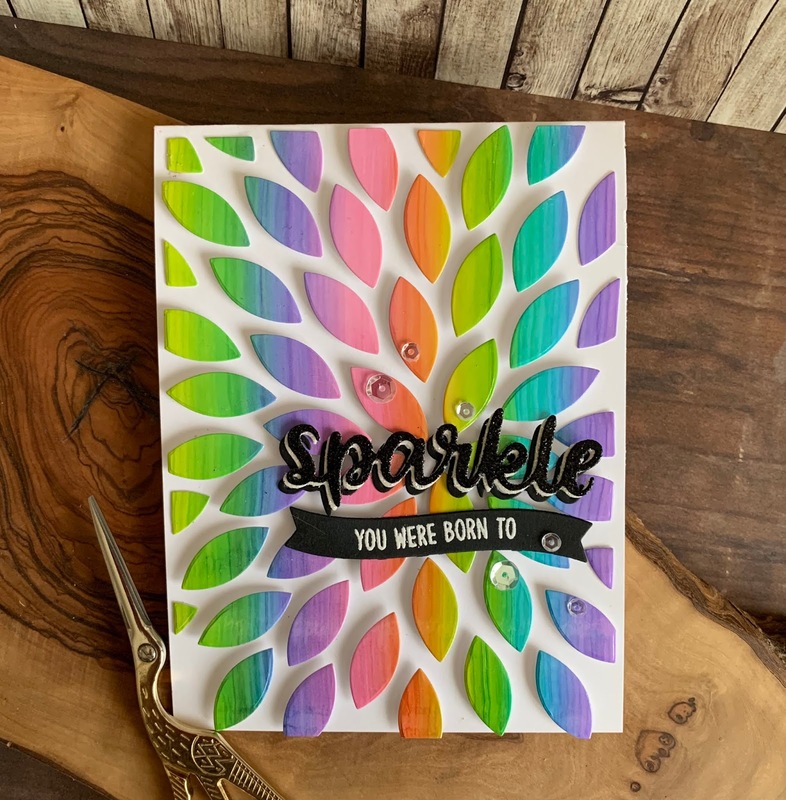 I then chose this fantastic die cut and sentiment set by Sunny Studio and Tonic Glitter paper. I die cut two black and one white piece and offset all three pieces. I then white embossed my secondary sentiment on Lawn Fawn Black Licorice cardstock. 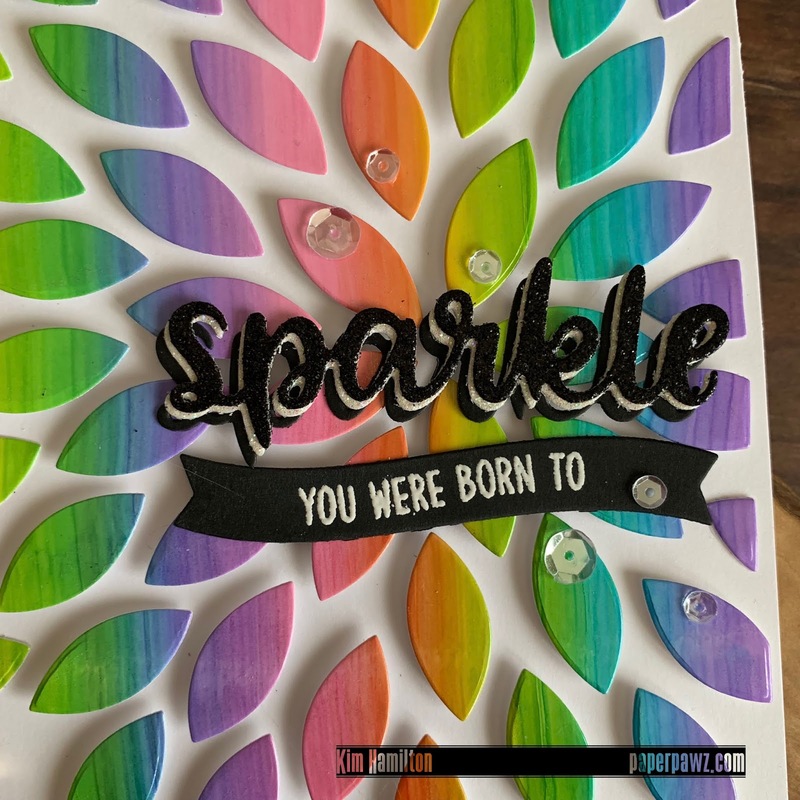 To finish off mu project, I added some Pretty Pink Posh Sparkling Clear Sequins. Thanks for taking the time! All products used are listed and linked below. Affiliate links used at no extra cost to you! what is the leaf die that you used? i don't see it on your list. beautiful card!! Simon Says: Anything Goes feat. Tim Holtz! Simon Says: Whatever the Weather! My Favourite Things Birthday Tri-Fold! Sending you a Paper Hug!